In the world of kitchen countertops, at the intersection of stunning design and cost-effectiveness, you will surely find Granite countertops. Granite countertops have long been a popular choice for the kitchen in homes because of their durability, water resistance, and impeccable designs. Granite countertops can be used whether in your kitchens, bathrooms and anywhere in your home. Granite tiles are thick and are heat resistant as well, which makes them a perfect choice for remodeling of kitchen countertop project of your home. With Granite countertops, you add luxury to your space without breaking your bank. Granite Tile Countertops installation is also easy although a professional is always recommended to install it correctly. Their timeless and classic designs which are endless to choose from. They are heat resistant so you don’t need to worry about the stain from a hot pan or kettle. They are waterproof, so any liquid spill can be easily washed. They are durable and last longer than other countertop materials. It is almost scratched, because Granite happens to be a very solid material so it can handle normal wear and tear pretty well. There are nearly endless designs and styles when it comes to the selection of natural Granite tile countertops. Firstly, you need to do a thorough inspection of the slabs that you like for any cracks and scratches to ensure it’s of premium quality. Slabs can be of various thicknesses; however, the thicker ones provide you with more edge options. All the granite countertops which are used for the kitchen will have a seam to go with them, however, the granite slabs have a gap between them filled with polyester resin. Slabs are installed together keeping a one and a half inch difference between them which is filled with polyester resin. Read the differences between Granite tile countertops and granite slabs. When you select your granite tile countertops, you will be asked to select the edge style as well. An eased edge is one of the tile design ideas for kitchen with a simple profile which is squared-off and the top edge is slightly rounded. While the perfect half circle is the edge provided by bullnose, a beveled edge means that its cut along one of the edges of the slab, on the other hand, an ogee edge makes somewhat of an S shape from a certain angle. There are various markers when it comes to grading a granite slab which includes its thickness, color, veins, pitting and marking, the country of origin, and the soft material count it has. The three ranges of granite are low-grade granite, often called the commercial grade which is usually a thinner slab and cost around 40-60$ (per square foot). Mid-grade granite is imported either from Brazil or India and is sold at 50-70$. The thickness of the slabs in this range is regarded as average to good and is widely used as a budget-friendly choice. The high-grade granite is considered to be the highest in quality because of its rarity. It sells from 60$- 100$ it has the most thickness of all the slabs. Granite has uncommon colors and patterns making it unique and special for the ones who like a luxury at its best whether choose for slabs, countertops or opt Granite flooring. 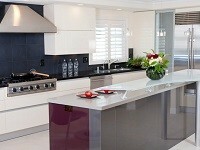 It is so hidden fact that thicker counters of Granite are superior in quality than their thinner counterparts. A granite countertop of thickness one and half inches is usually preferred for quality kitchen countertops. Slabs which are less than an inch in thickness are not preferred for counters and are lesser in quality and are not durable. When talking about Granite countertops, the possibilities of design and color are limitless. From soft and posh white hues to the intricate designs of antique and medieval ages, the cuts and designs of granite never cease to impress. However, slabs of lighter tones of powder white are in trend right now. Granite tile countertops have various prices, depending upon their grading and origin. The country where the granite originated has a huge impact on the price of granite. The granite from China is comparatively cheaper due to lower labor costs, on the other hands, granite from Brazil and Italy is more costly. Granite is a heavy stone, thus comes with the cost of shipping depending on the distance from where it is purchased. This granite combines the perfect mixture of pale silver with the frosty whites with neutral warm and hues of onyx. It is imported from Brazil and is available in various slab sizes. These granite tiles create impeccable countertops with backsplashes, floors, accent walls and other areas where you want to install it indoors as well as outdoors. This granite is usually black granite with hints of gold and flecks of white. It is available both in tiles and slabs for coordinated and creative installations. It is equally suitable for exterior and interior installations and is used in flooring, accent walls, countertops, and others. This granite is imported from Saudi Arabia and has black and brown colors in low variations. This is a very sturdy and durable granite and is often used for outdoor installations as it can withstand extreme temperatures. It is used in commercial as well as residential projects. This granite countertop has been an absolute favorite of many homeowners simply because of it’s durable and long lasting. Grey mist kitchen countertops are used both in commercial and home kitchens. It has light and dark greys which are highlighted with warm tones which accentuates the natural beauty of the stone. This granite has tons of gold and beige with a very light veining of grays, browns and deep red. 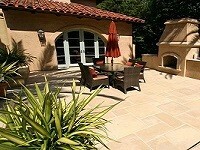 It is available in both forms, like tiles and slabs for indoor and outdoor installations. Mopping for dust – A clean dry dust mop is an essential tool when it comes to cleaning your granite countertops. Sand and dust can damage the stone if not regularly removed. Rugs – keeping rugs or foot mats outside or inside your doorways would help minimize the dirt and sand to enter the house and affect granite. Cleaning – change the rinse water as frequently as possible and rinse thoroughly. In outdoor areas, clean water with a mild bleach solution would be ideal to clean your granite tile countertops. Spills – in case of any spill, use a power towel instead of wiping the area, it will spread the spill on the surface of the granite and might affect the natural stone. Granite countertops most often installed in kitchens and bathrooms. It is a hard and durable stone that can be styled into many shapes and requires professional assistance as they are much heavier. It is recommended that the counterfeiter of the kitchen granite countertops do the installation to make these adjustments. Learn how our experts take the installation procedure of granite kitchen countertops. In case you are inclined towards installing granite tiles in your home because it is budget-friendly, then look no further than Westside Tile and Stone as we specialize in the installation of granite countertops. We have a vast experience in installation of countertops be it in your kitchen or flooring indoors and outdoors. We are a CTEF Certified Installer (CTI), the best-experienced granite kitchen countertops contractor that meets with industry standards and best practices. We have a large selection of granite tiles for all your home applications to choose from. Contact us today or call us now at 818.704.9222 or 310.276.9222 to schedule a free, in-home consultation or visit our tile store and explore the fascinating collection of granite tiles countertops. Living in Southern California, we work with the residents of Agoura Hills, Beverly Hills, Brentwood, Calabasas, Encino, Hidden Hills, Malibu, Northridge, Pacific Palisades, Pasadena, Santa Monica, Sherman Oaks, West Hills, West Hollywood, Los Angeles, and the surrounding areas.